Buss Up Shot !! Trinidadian Roti Paratha!!! The large Indo-Caribean community of the Caribbean Islands has a great influence on the food and culture of these islands. 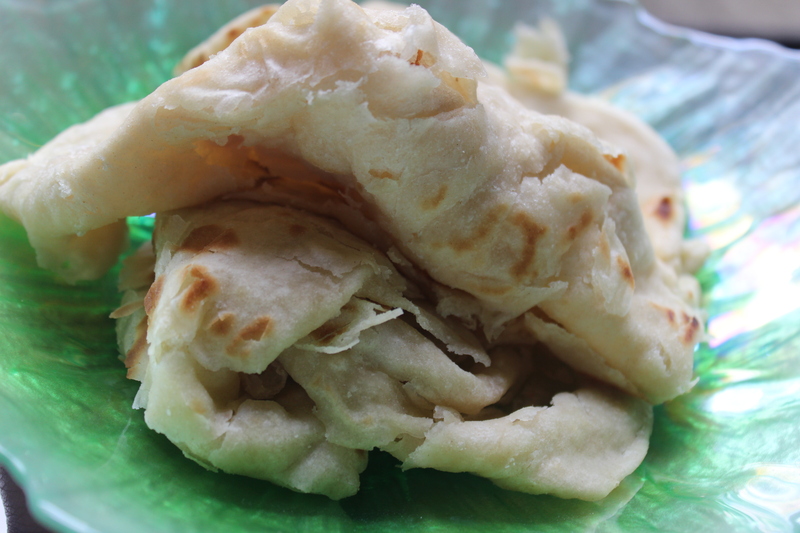 Today’s recipe is one of the Indo Caribbean speciality the famous Paratha roti – Buss up shot . So Soft and doesn’t become soggy long after it is made . The perfect combination of roti and paratha in one single thing !! 1. Take a wide bowl and mix 1 cup of all purpose flour with 2 tea spoon baking powder , 1 tea spoon sugar and salt to taste . Now add luke warm water gradually to make a soft dough . Knead . Now add 1 tea spoon oil and knead again . You don’t need to knead vigorously . Just enough to incorporate well.Make a round ball of the dough . Now cover the dough with a damp cloth for at least half n hour . 2. Dust the surface of the place for rolling . Now make 2 or 3 balls from the round ball and roll out thin . apply clarified butter/ ghee or margarine . Now take a knife and give a cut mark , then roll out the roti like a cone . Tuck the edge inside and flatten it like a patty . 3. Put these patties in a close lid box for atleast 2 hours . The more , the better , that would help to give that layered effect . 4. After 4 hours roll them out thin on a flour dusted surface . Fry them on a hot tawa . The roti will puff up . Brush little oil on each side of the roti . Not too much . 5. Smash the rotis with your hands or using two spatula to bring out the layers while they are hot . This entry was posted in Glossary / Notes and tagged Buss up shot, caribbean bread, guyanese bread, guyanese paratha, Paratha roti, Trinidadian roti paratha. Bookmark the permalink.